Infographics are highly effective means of presenting data using as little space as possible. When it comes to presentations, no one wants long slides of endless text, which are tedious and boring. This is why infographics are very useful for presenting the most data in a very interesting and highly visual manner through the use of images and graphics. 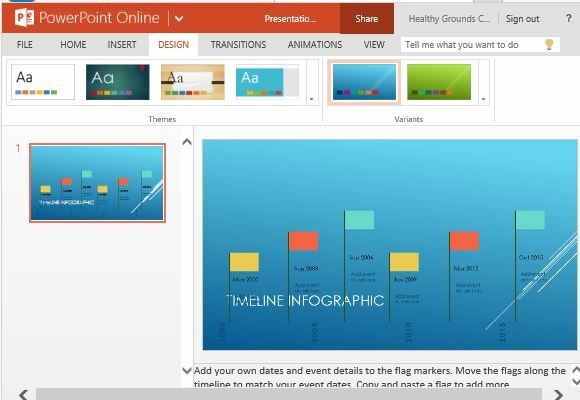 This Timeline Infographic Maker Template for PowerPoint is professionally designed to present data in an organized and chronological manner through a visual timeline. Using this template you can create a story as it progresses over a period of time. 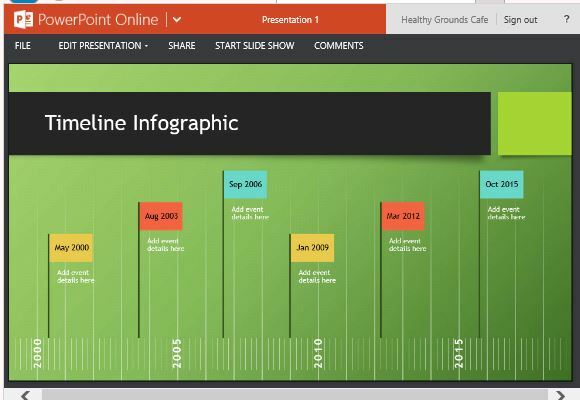 This PowerPoint Template features a gradient green background that looks like a sports field. The timeline comes in the form of flags spattered across the slide to indicate highlights, milestones, and many significant events. The flags are sports-themed to match the background and comes in various colors such as yellow, red and blue. Meanwhile, the title of the timeline is located on top, with a black band background so the header stands out. Like what most infographics are: visual, minimal and straightforward, this template is all about telling an otherwise long story with a single slide. This designs is very common these days, especially with people having a shorter attention span and needing information presented to them fast and in an instantly understandable manner. This timeline infographic allows you to tell a story, progression or stages, that happen through a span of an era, generation, decades, years, or even just days. With the widescreen, 16:9 landscape orientation, you can truly maximize the horizontal and vertical spaces so you can easily type the dates on the placeholders, as well as label the highlights or milestones on the flags. 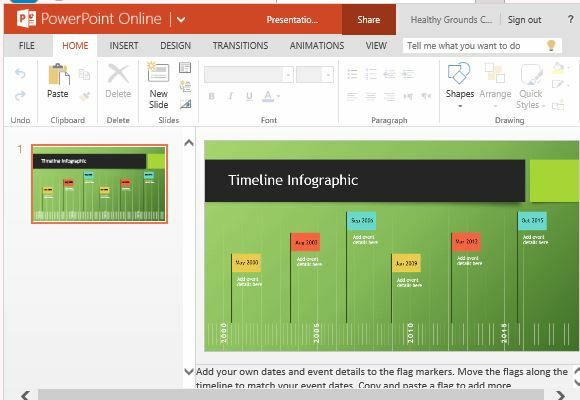 The timeline infographic maker for PowerPoint Online is perfect for sports topics, since the flags resemble the type that are given to soccer players while the background looks like a wide expanse of grass and resembles a soccer or football field. However, despite this style, the template can still be used for a wide variety of topics where you need to create a timeline without taking up much space or as many slides on your presentation. Aside from sports topics, such as football history or soccer game highlights, you can also use it for business, personal or education presentations. To customize, simply edit the placeholders located in the flags and along the timelines itself. If you also want to add more events, you can copy and place the flags and move them to their right place along the timeline. Alternatively, you can also duplicate the whole slide to present two or more timelines, depending on your presentation needs.